How do I assign variables? How do I access subsets of a data frame? How do I calculate simple statistics like mean and median? Perform operations on a data frame of data. The expression read.csv(...) is a function call that asks R to run the function read.csv. read.csv has two arguments: the name of the file we want to read, and whether the first line of the file contains names for the columns of data. The filename needs to be a character string (or string for short), so we put it in quotes. Assigning the second argument, header, to be FALSE indicates that the data file does not have column headers. We’ll talk more about the value FALSE, and its converse TRUE, in lesson 04. In case of our inflammation-01.csv example, R auto-generates column names in the sequence V1 (for “variable 1”), V2, and so on, until V30. read.csv actually has many more arguments that you may find useful when importing your own data in the future. You can learn more about these options in this supplementary lesson. Depending on the country you live in, your standard can use the dot or the comma as decimal mark. Also, different devices or software can generate data with different decimal points. Take a look at ?read.csv and write the code to load a file called commadec.txt that has numeric values with commas as decimal mark, separated by semicolons. A function will perform its given action on whatever value is passed to the argument(s). For example, in this case if we provided the name of a different file to the argument file, read.csv would read that instead. We’ll learn more about the details of functions and their arguments in the next lesson. Since we didn’t tell it to do anything else with the function’s output, the console will display the full contents of the file inflammation-01.csv. Try it out. read.csv reads the file, but we can’t use the data unless we assign it to a variable. We can think of a variable as a container with a name, such as x, current_temperature, or subject_id that contains one or more values. We can create a new variable and assign a value to it using <-. Once a variable is created, we can use the variable name to refer to the value it was assigned. The variable name now acts as a tag. Whenever R reads that tag (weight_kg), it substitutes the value (55). To see the value of a variable, we can print it by typing the name of the variable and hitting Return (or Enter). In general, R will print to the console any object returned by a function or operation unless we assign it to a variable. We can add comments to our code using the # character. It is useful to document our code in this way so that others (and us the next time we read it) have an easier time following what the code is doing. Historically, R programmers have used a variety of conventions for naming variables. The . 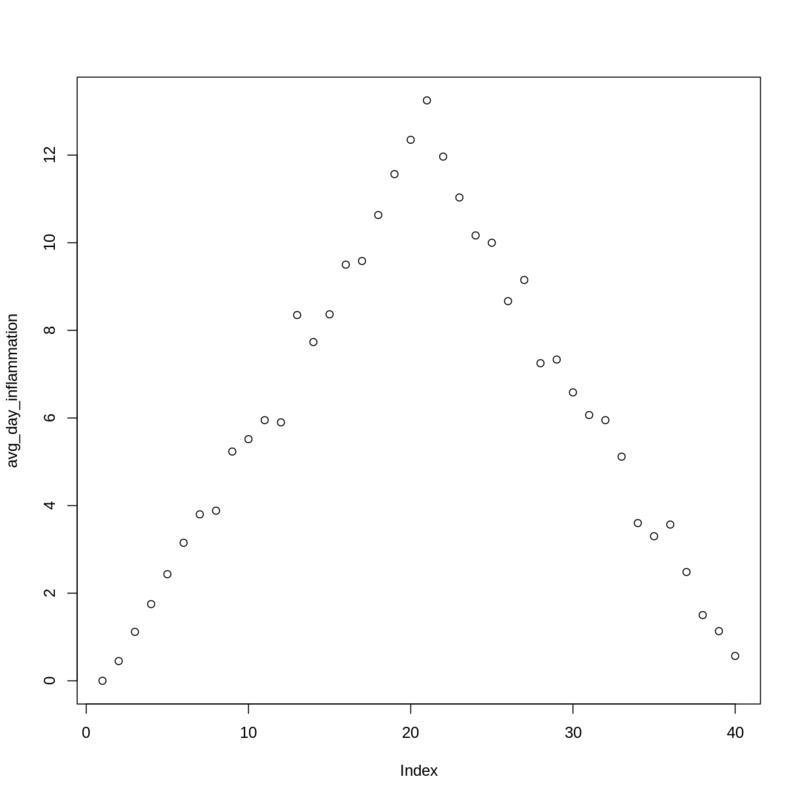 character in R can be a valid part of a variable name; thus the above assignment could have easily been weight.kg <- 57.5. This is often confusing to R newcomers who have programmed in languages where . has a more significant meaning. Today, most R programmers 1) start variable names with lower case letters, 2) separate words in variable names with underscores, and 3) use only lowercase letters, underscores, and numbers in variable names. The book R Packages includes a chapter on this and other style considerations. Assigning a new value to a variable breaks the connection with the old value; R forgets that number and applies the variable name to the new value. When you assign a value to a variable, R only stores the value, not the calculation you used to create it. This is an important point if you’re used to the way a spreadsheet program automatically updates linked cells. Let’s look at an example. Since weight_lb doesn’t “remember” where its value came from, it isn’t automatically updated when weight_kg changes. This is different from the way spreadsheets work. An alternative way to print the value of a variable is to use () around the assignment statement. As an example: (total_weight <- weight_kg + weight_lb) adds the values of weight_kg and weight_lb, assigns the result to the total_weight, and finally prints the assigned value of the variable total_weight. This statement doesn’t produce any output because the assignment doesn’t display anything. If we want to check if our data has been loaded, we can print the variable’s value by typing the name of the variable dat. However, for large data sets it is convenient to use the function head to display only the first few rows of data. The output tells us that it’s a data frame. Think of this structure as a spreadsheet in MS Excel that many of us are familiar with. Data frames are very useful for storing data and you will use them frequently when programming in R. A typical data frame of experimental data contains individual observations in rows and variables in columns. This tells us that our data frame, dat, has 60 rows and 40 columns. If you want to select all rows or all columns, leave that index value empty. If you leave both index values empty (i.e., dat[,]), you get the entire data frame. Columns can also be addressed by name, with either the $ operator (ie. dat$V16) or square brackets (ie. dat[, 'V16']). You can learn more about subsetting by column name in this supplementary lesson. Note that R may return an error when you attempt to perform similar calculations on sliced rows of data frames. This is because some functions in R automatically convert the object type to a numeric vector, while others do not (e.g. max(dat[1, ]) works as expected, while mean(dat[1, ]) returns an error). You can fix this by including an explicit call to as.numeric(), e.g. mean(as.numeric(dat[1, ])). By contrast, calculations on sliced columns always work as expected, since columns of data frames are already defined as vectors. For every column in the data frame, the function “summary” calculates: the minimun value, the first quartile, the median, the mean, the third quartile and the max value, giving helpful details about the sample distribution. To support this, we can use the apply function. To learn about a function in R, e.g. apply, we can read its help documention by running help(apply) or ?apply. apply allows us to repeat a function on all of the rows (MARGIN = 1) or columns (MARGIN = 2) of a data frame. Thus, to obtain the average inflammation of each patient we will need to calculate the mean of all of the rows (MARGIN = 1) of the data frame. And to obtain the average inflammation of each day we will need to calculate the mean of all of the columns (MARGIN = 2) of the data frame. Since the second argument to apply is MARGIN, the above command is equivalent to apply(dat, MARGIN = 2, mean). We’ll learn why this is so in the next lesson. Some common operations have more efficient alternatives. For example, you can calculate the row-wise or column-wise means with rowMeans and colMeans, respectively. Suppose you want to determine the maximum inflammation for patient 5 across days three to seven. To do this you would extract the relevant subset from the data frame and calculate the maximum value. Which of the following lines of R code gives the correct answer? Explanation: You want to extract the part of the dataframe representing data for patient 5 from days three to seven. In this dataframe, patient data is organised in rows and the days are represented by the columns. Subscripting in R follows the [i, j] principle, where i = rows and j = columns. Thus, answer 3 is correct since the patient is represented by the value for i (5) and the days are represented by the values in j, which is a slice spanning day 3 to 7. Using the inflammation data frame dat from above: Let’s pretend there was something wrong with the instrument on the first five days for every second patient (#2, 4, 6, etc. ), which resulted in the measurements being twice as large as they should be. Challenge: the apply function can be used to summarize datasets and subsets of data across rows and columns using the MARGIN argument. Suppose you want to calculate the mean inflammation for specific days and patients in the patient dataset (i.e. 60 patients across 40 days). calculate the mean inflammation for days 1 to 10 (across all patients). calculate the mean inflammation for every second day (across all patients). Think about the number of rows and columns you would expect as the result before each apply call and check your intuition by applying the mean function. The mathematician Richard Hamming once said, “The purpose of computing is insight, not numbers,” and the best way to develop insight is often to visualize data. Visualization deserves an entire lecture (or course) of its own, but we can explore a few of R’s plotting features. Let’s take a look at the average inflammation over time. Recall that we already calculated these values above using apply(dat, 2, mean) and saved them in the variable avg_day_inflammation. 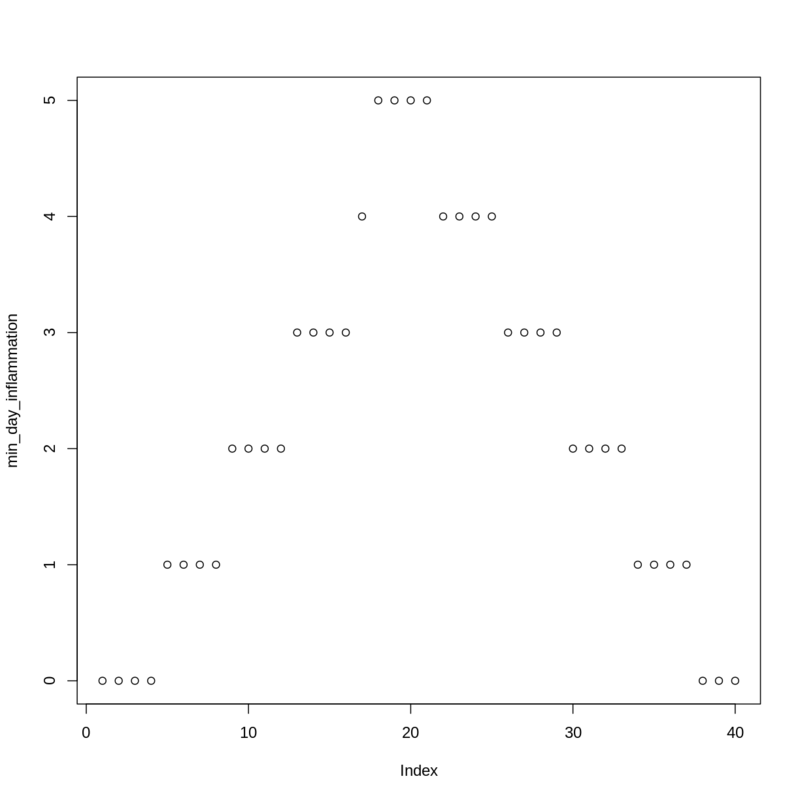 Plotting the values is done with the function plot. Above, we gave the function plot a vector of numbers corresponding to the average inflammation per day across all patients. plot created a scatter plot where the y-axis is the average inflammation level and the x-axis is the order, or index, of the values in the vector, which in this case correspond to the 40 days of treatment. The result is roughly a linear rise and fall, which is suspicious: based on other studies, we expect a sharper rise and slower fall. Let’s have a look at two other statistics: the maximum and minimum inflammation per day. 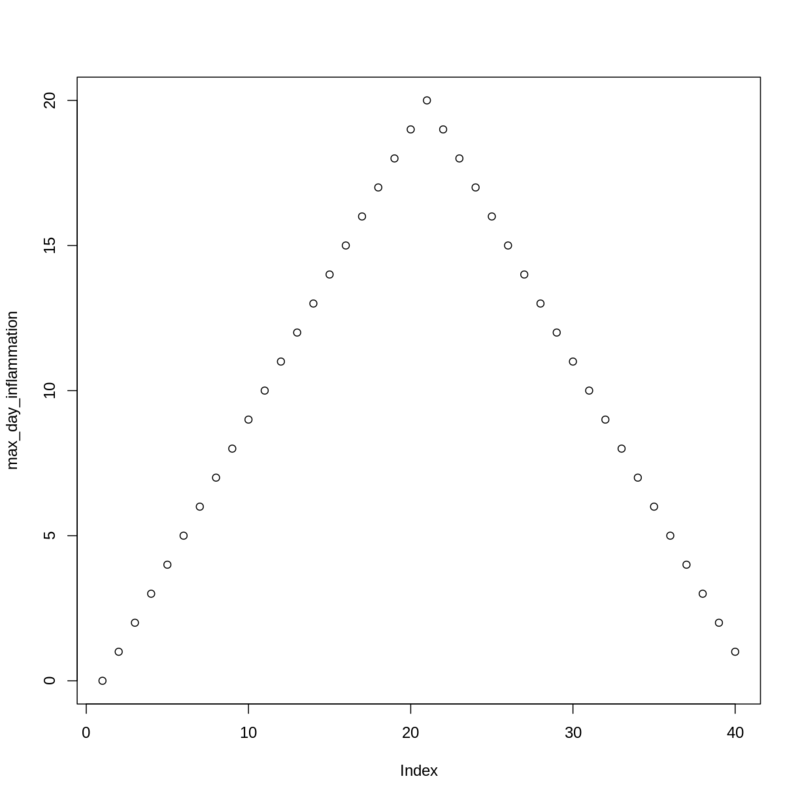 The maximum value rises and falls perfectly smoothly, while the minimum seems to be a step function. Neither result seems particularly likely, so either there’s a mistake in our calculations or something is wrong with our data. Use variable <- value to assign a value to a variable in order to record it in memory. Objects are created on demand whenever a value is assigned to them. The function dim gives the dimensions of a data frame. Use object[x, y] to select a single element from a data frame. Use from:to to specify a sequence that includes the indices from from to to. All the indexing and subsetting that works on data frames also works on vectors. Use # to add comments to programs. Use mean, max, min and sd to calculate simple statistics. Use apply to calculate statistics across the rows or columns of a data frame. Use plot to create simple visualizations.